Every time I pick a new theme, I am always very conscious about creating ideas for birthday parties. My main job is as a magician and entertainer. I perform at hundreds of birthdays parties every year so you will notice that almost all of the the ideas I post would work in one way or another at a kids birthday party. Well this week we are looking at nothing but great ideas you can try at your kids birthday party for some Paw Patrol fun. Lets start with the basics, first you should schedule a call from Chase or one of the other characters. This is free to do on the Nick website here. Now lets go through some cool free printables to help theme your party, just click on them to download them. Scroll down for more great ideas. Here is a great game that is super easy to play. I like non elimination games for birthday parties because typically they are only with you for an hour or maybe two hours max. There really isn't time to keep stopping the fun to explain about winning and losing. Everyone wins, everyone's happy. So this game is a lot of fun. also here is another Paw patrol Game I've covered previously. Print out the badges from the free template opposite, you'll need to print them on good quality card stock or on paper and stick them onto card. You will need one set of badges per player, these badges then need to be hidden around a room or ideally outside in the garden. Now every player gets a badges collection board and when they find a badge they need to stick it on the board. I like to play this game as a team effort and everyone wins a prize but only when everyone has found all of there badges. this way the kids help each other and swap badges if they find one they already have etc. Ok so I love the idea of using dog food bowls to serve food in for a Paw Patrol Party. Take a look at these great table lay out. You can find out more about table lay outs here. Now for food how about some Pup-Corn, adding popcorn in a dog bowl will go down a treat. Or long chewy sweets as dog chews. Take a look at the pic below for some more ideas. One of my favourite ideas are the dog bone sandwiches. I know from making my own daughters school lunches that changing the shape of a sandwich can make them massively more popular. 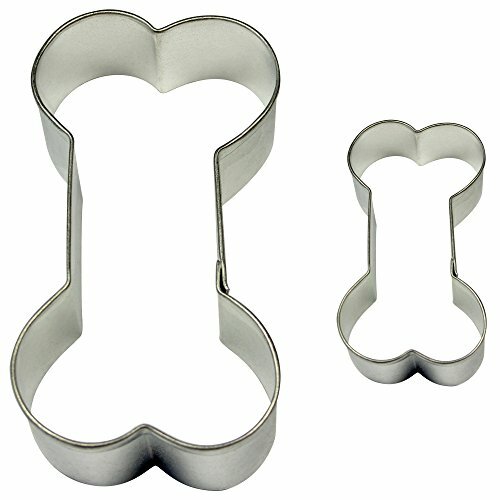 You can just use a dog bone cookie cutter like the one I found below. This cookie cutter is a bargain of a buy, how about trying these great marshmallow/rice crispy treats or bones on crackers and use the cutters to cut cheese and ham that the kids can then place on crackers. Another great party food item that kids love is to build their own food so this is like a nice snack and playtime all rolled into one. The ideas are endless, plus once the party is over you have something that you can then use for a fun surprise in the school lunch box too. I really hope all of these ideas are helpful for you. I think Paw Patrol is a great theme for birthday parties, You have almost everything here, party supplies and decorations, Party food ideas and finally check out these cake designs. Im not a baker, I mean I love to cook but baking is like magic to me. I love how clever the bone cake is, to me it looks like it should be quite simple but the design is very clever. The tier cake looks amazing and to me that is one for the pro bakers.